Edward Ardizzone, Paul Nash, Mervyn Peake and Ronald Searle are among the artists featured in the exhibition Artists of Radio Times: A Golden Age of British Illustration, which runs at the Ashmolean Museum of Art & Architecture on Beaumont Street in Oxford from 12 June until 7 September. 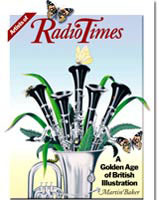 The aim of curator Martin Baker, who also designed the exhibition catalogue (cover picture by Peter Brookes), is to highlight the craft of draughtsmanship in the age of Adobe software such as Photoshop, and the heritage of the long-running magazine proves fertile ground for examples of virtuoso illustration. Portraits of the poet John Betjeman, The Archers radio star Walter Gabriel and TV personalities Muffin the Mule and Stephen Fry are showcased alongside drawings for classic programmes like The Singing Detective and The Lord of the Rings. In total, 150 illustrations – by turns serious and irreverent, sombre and playful – are include in the exhibition.